Biochemist and PhD in Immunology, National University of Córdoba (Argentina). Senior Investigator of CONICET. Full Professor at the School of Exact and Natural Sciences, University of Buenos Aires. Head of the Immunopathology (IBYME) and the Structural and Functional Glycomic (FCEyN-UBA) Laboratories. Deputy Director of IBYME and visiting Professor at international universities. Born in January 11, 1969 in Córdoba, Argentina. 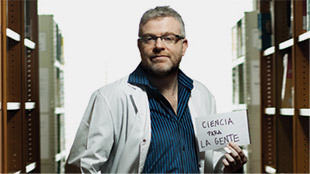 After graduating with a degree in Biochemistry and training in Molecular Biology at the Kennedy Institute of Rheumatology in London (1998), he obtained a Ph.D. in Immunology from the University of Córdoba (1999) and a post-doctoral position at the University of Buenos Aires. He is a member of the Argentinean National Academy of Science and received the Bunge & Born Prize for Young Scientist (2005) and the Highest Prize of Bunge & Born Foundation for Life Achievements in Argentina (2014). He also won the Honor and Platinum Konex Prizes in Biomedicine (2013) awarded to the top scientists in Experimental Medicine. He also received the TWAS (Third World Academy of Science) Prize in Medical Sciences (2010) and the Bernardo Houssay Medal from the Ministry of Science and Technology (2004, 2011). In 2006, he got the John Simon Guggenheim Award (New York) and received the Mizutani Foundation Award for Glycoscience (2005, 2010; Tokyo). Dr. Rabinovich held visiting professorships at several universities, serves on the Editorial Boards of 12 journals and has mentored numerous PhD and post-doctoral fellows. He has been invited to write reviews in the most influential journals, including Nature Reviews Cancer, Nature Reviews Immunology, Annual Reviews Immunology, and to speak at more than 220 international conferences. He is Senior Investigator of the National Research Council (CONICET) and Full Professor of Immunology at the University of Buenos Aires. He currently heads both the Division of Immunopathology at the Institute of Biology and Experimental Medicine (IBYME) and the Laboratory of Structural and Functional Glycomics at the University of Buenos Aires and is deputy director of IBYME. He published more than 200 articles, most of them in high impact journals including Cell, Nature Immunology; Nature Medicine, Cancer Cell, Journal of Experimental Medicine, Immunity, PNAS, Cancer Research and Journal of Immunology. His work has received more than 12.000 citations (H Index Google Scholar 58; H Index Scopus 52; data from July 2015). His recent paper describes a novel mechanism of compensatory angiogenesis mediated by galectin-glycan interactions. Our work builds on the primary discovery of the immunoregulatory functions of galectins, a ubiquitous family of endogenous glycan-binding proteins. We found that galectin-glycan interactions are the crucial components of a novel immune inhibitory checkpoint that reduces excessive inflammation while at the same time prevents autoimmune pathology and promotes immune tolerance during pregnancy. Mechanistically, we have shown that galectin-dependent regulatory programs can blunt harmful immune responses by selectively depleting specific T cells (Th1 and Th17), by triggering the differentiation of tolerogenic dendritic cells, promoting expansion of regulatory T cells and by inducing polarization of macrophages-microglia toward an ‘M2-type’ anti-inflammatory phenotype. We found that a dynamically-regulated ‘glycan signature’ acts as an ‘on-and-off’ switch that controls the regulatory function of galectins. Notably, we have shown that malignant cells can usurp the galectin-glycan pathway to create immunosuppressive networks that thwart antitumor responses. More recently we discovered that galectin-1-glycan interactions maintain tumor vascularization in tumors refractory to anti-angiogenic treatment by mimicking the signaling activity of vascular endothelial growth factor (VEGF). In summary, our work has elucidated novel pathways via which endogenous galectins translate glycan-encoded information into unique regulatory programs, findings with broad implications in the fields of immune regulation, oncology and vascular biology. These discoveries have opened new possibilities for the development of innovative strategies aimed at potentiating antitumor responses, limiting autoimmune inflammation and overcoming aberrant angiogenesis. Our team works at the interface of immunology, tumor biology and glycobiology, using in vitro and in vivo approaches, to understand how the molecular interactions between endogenous lectins and their ligands can mediate cellular processes relevant to immune tolerance, inflammation and angiogenesis. For more than 20 years we have investigated the role of glycan-binding proteins in mediating cellular processes central to immune regulation and human diseases. Our team, composed of chemists, molecular and cell biologists, share the common goal of performing fundamental research as well as preclinical validation of rational therapeutic strategies for inflammation, autoimmunity and cancer. Our goal is to contribute with new findings that bridge the gap between fundamental glycoscience and immunobiology and the development of novel therapeutic targets in inflammation, autoimmunity and cancer. Our studies, summarized in more than 200 publications in world-leading journals, allowed the identification of a novel paradigm based on galectin-glycan interactions in immunological homeostasis and the design of novel therapeutic approaches in autoimmunity and cancer.